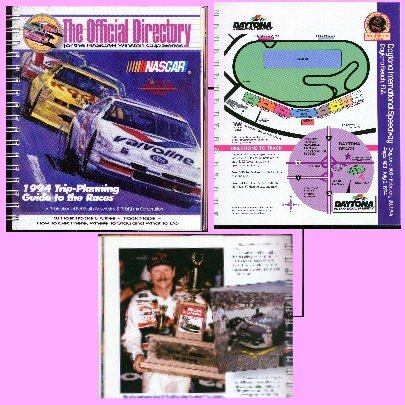 "The Official Directory for the Nascar Winston Cup Series"
(323)The Official Nascar Directory for 1994 Includes the Trip-Planning Guide to the Races.-Condition:Excellent This is a thick ringed guide book. Book has well over 100 pages. The cover has the Nascar Symbol with the Valvoline Ford and Kodak Car drawn as if racing. This guide includes everything for the racing circuit: Maps, lists of lodging, good eats, a Comprhensive description and history of each Race Track. The book has lamenated cardboard pages spaced between the regular paper ones. The first part of the book is dedicated to articles about some of the favorite drivers (Dale Earnhardt, Rusty Wallace, Harry Gant, Jeff Gordon, Mark Martin, and Ernie Irvan. These articles are full of colored photographs. A really beautiful book for Racecar Fans! Price: $18.00 + shipping.